Create guidance materials for staff on where to save and store information, based on types of information, the systems employed by the school, and intended audiences. Make these widely available to staff and conduct regular monitoring of information environments to ensure permissions are being well managed and staff are complying with the guidance. Provide risk management training and coaching for senior leadership team members to build capability and support the Principal through sound judgment and good decision making about risks and how to mitigate them. Principal to consider regular risk management conversations with the senior leadership team as part of regular meetings. Work with the Department’s privacy team to provide additional privacy training, targeted at all staff and the specific staff members involved in this incident. Organise cybersafety and information privacy session(s) run by Victoria Police for senior students. The School fully accepts these recommendations and is working closely with the Privacy team to implement them. Privacy training has been conducted for all staff this week and the other actions have also commenced. In addition to these recommendations, there are Department-wide actions to provide more detailed guidance materials for schools on using different systems including Compass, providing more targeted support materials for different audiences in schools, including wellbeing and learning support coordinators, and rolling out further training to regional office and school staff, including both face-to-face training and eLearning. Regional staff and school psychologists are recommended to continue following up with Strathmore to support post-incident stress and anxiety and support the School to manage any bullying issues based on the information disclosed about individual students. If you would like further information about the actions that we are taking to respond to the incident or you have any ongoing or outstanding concerns, please do not hesitate to contact me directly. In recent weeks, year 8 students have participated in fieldwork trips to Sandringham and Hampton beaches. This complements their study of coastal landforms and develops geographical skills. 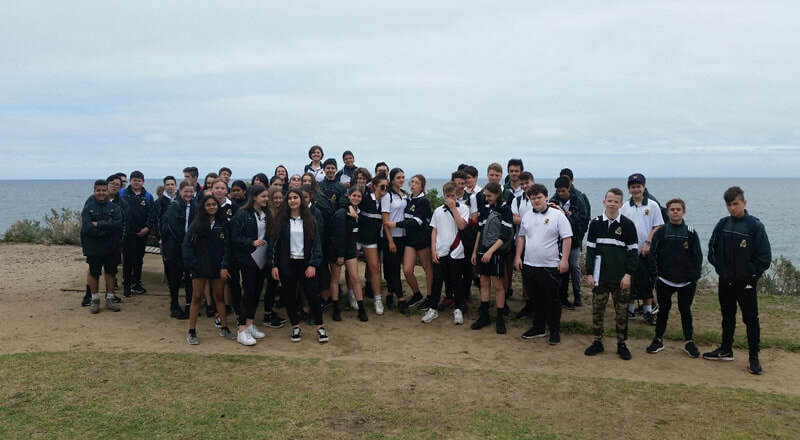 The weather was largely kind to us and the students and staff enjoyed themselves whilst learning a lot about the strategies put in place to maintain the beach environment. In the morning, all four classes (8A2, 8C1, 8D1 & 8D2) prepared to venture out on our year 8 Geography excursion. Once everyone was gathered and organised, we made our way to Strathmore Station with smiles on our faces. We exited the train at Flinders Street where we caught another train to Hampton Beach. As we departed on our second train, we gathered our thoughts, ready to start. At each beach, we studied coastal features, landforms and facilities that support it. Sandringham beach has better and improved facilities. Facilities at Sandringham were impressive and far outweigh Hampton Beach, Sandringham beach has facilities which include kiosks, toilets, kayak hire, taps, parking and places to leave your bike. Hampton beach only has taps and toilets for facilities. There were less people at Sandringham, vegetation was improved and remarkable at both beaches. Natural features included plants, cliffs, beach, sand and rocks. Human impacts are evident on both beaches with littering, pollution and strained resources. Hampton beach and Sandringham beach both have depositional landforms like bays and spits. The beaches also have used defensive strategies which are in place to prevent longshore drift. Beaches lose sand through longshore drift which takes the sand and transports it. The strategies used are groynes which are straight lines of wood or rock that prevent longshore drift. The other strategy used is beach nourishment which is the replacement of sand using trucks to move it. The tire marks and fresh sand led us to infer that beach nourishment had been used recently. After a hard day of working, we were finally rewarded with lunch. It was a highlight as we were able to display our virtues of independence and responsibility. We regrouped an hour later, to return back to Strathmore. All in all, it was a fantastic day our whole class enjoyed.